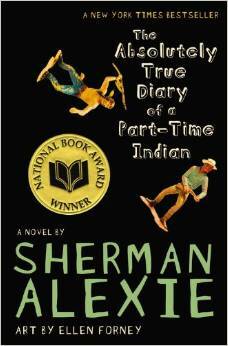 I finally got around to reading Sherman Alexie’s bestseller, The Absolutely True Diary of a Part-Time Indian. There’s just times in your life when you’ve got to rectify old wrongs, and this was one of them. I had to read that book. So I took Alexie’s book out of the library and read it. Now I am a member of the club and say without hesitation: Stop wasting your life and read it already! Today I’m not looking to review a book that’s already been reviewed hundreds of times. My focus is on the book’s final two paragraphs. To me, those six sentences felt exactly right, forming a poignant, understated conclusion. Rowdy and I played one-on-one for hours. We played until dark. We played until the streetlights lit up the court. We played until the bats swooped down at our heads. We played until the moon was huge and golden and perfect in the dark sky. I love the repetition of “we played,” repeated four times, the rhythmic, accumulative power of that device, the simplicity of the word choice, the interplay between light and dark, and that great, four-word conclusion. We didn’t keep score. Perfection. Back four years ago, I wrote a decent post titled “Best Last Lines from Books,” and I think you might enjoy it. So click away, folks. It’s absolutely free. NOTE: Apologies for the type-size weirdness of my reply. I don’t have the patience to try to fix it now. I am a fan of your books! My class wrote you. I live in Richmond Hill, Ontario and my name is Paige. I go to Red Maple Public School and I am 7 years old. I bring home Jigsaw Jones books for homework and my teacher even reads Jigsaw Jones books my whole class. How many Jigsaw Jones books have you made? Where do you live? I am even making a Jigsaw Jones mystery story for author day in class. My Jigsaw Jones story is called The Case Of The Double Jigsaw. Why did you make Jigsaw’s real name Theodore but he didn’t like his name so he asked people to call him Jigsaw? I know he likes jigsaw puzzles. The very first Jigsaw Jones story I read was The Case of the Glow and the Dark Ghost. What is your favourite Jigsaw Jones book. Please write back. As a writer, of course, I love your name — Paige. So it’s only natural that you’d grow up to be a reader. * There are 40 Jigsaw Jones books in all, but some go in and out of print. Collecting them all is a real challenge! * I live in Delmar, NY. * I knew that most parents would not name their son “Jigsaw” — it had to be a nickname, and I needed for Jigsaw to prefer his nickname over his birth name. So I also gave him a birth name, a name that I did not particularly like. Thus, Theodore. My apologies to all the Theodores in the world. It’s not personal, guys. * Tough question, because I don’t really have a single favorite. For the mystery, I like The Case of the Buried Treasure and The Case of the Haunted Scarecrow. The clues fell into place in a nice way. For the setting, I like the camping trip in The Case of the Marshmallow Monster. For clients, I love Bigs Maloney in The Case of the Great Sled Race, Reginald Pinkerton Armitage III in The Case of the Golden Key, and Sally Ann Simms in The Stinky Science Project. I guess there are things that I love, and things that I don’t love, about each book. I’ve never written a perfect one yet! Thanks for your COLORFUL query! P.S. 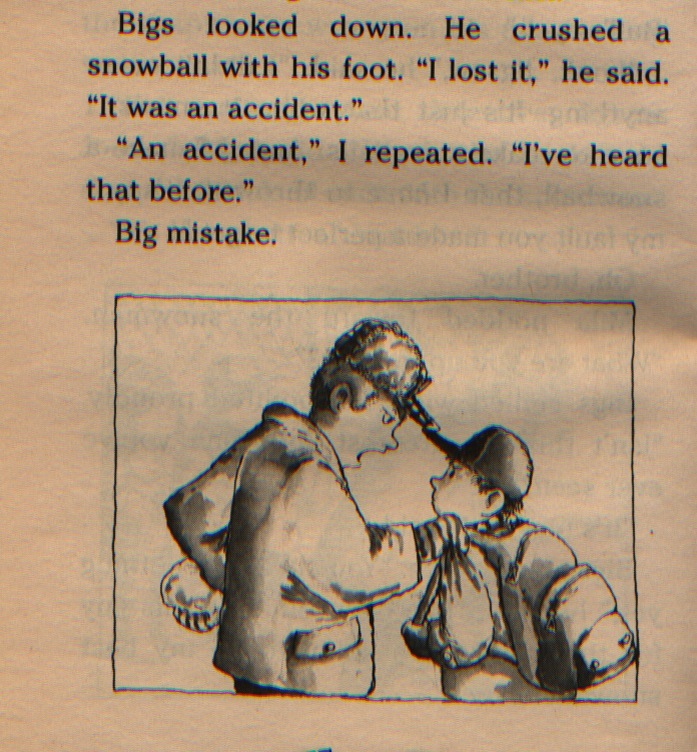 This might be my favorite illustration from the series, because it says so much about Jigsaw. It was drawn by R.W. Alley for The Case of the Christmas Snowman.